In the 12th century Clement of Lanthony wrote a 'Harmony of the Gospels': a compilation of the four different gospel narratives into one. In the early 14th century, William of Nottingham, a Franciscan, wrote a lengthy commentary on Clement's work (this copy is now bound in two huge volumes). A colophon at the end of this manuscript records that it was written in 1381 for John Leyre, rector of the church of Great Doddington, Northamptonshire; he later moved to Olney, Buckinghamshire; and the manuscript was later given to the Benedictine abbey at Evesham. The main inscription on this flyleaf records that the manuscript was given to the monastery of Evesham by John Wykwon, abbot of Evesham (1436-1460) on the feast of St. Augustine (28 August), 1458. 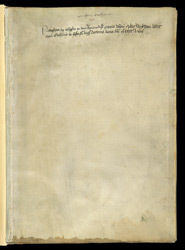 The ownership note 'Monasterii Eveshamie', above this was added later.